Ilosaarirock Festival loves the environment. Unfortunately organising a large festival is not very environmentally friendly as such. We are well aware of this. Ilosaarirock Festival takes place in a very beautiful park area, and we certainly want the area to stay beautiful in the future. That's why we make an effort to protect the environment by minimising the negative effect the festival has on it. At the same time we want to encourage others to consider the enviroment as well in their choices, whether it be the little pond close to your house or the Amazon rainforests. Every year it's possible to be better towards the environment. At least we promise to try. When large crowds gather together for several days of fun, one of the results is always waste and litter. The Ilosaarirock festival aims at decreasing the amount of waste by not using any unnecessary flyers or individual packaging materials, providing effective recycling facilities for biodegradable waste, and cleaning the festival area and its surroundings quickly and efficiently. The food sellers in Ilosaarirock will only use biodegradable plates and cutlery, so all waste produced by catering can be recycled as biodegradable waste. The amount of recyclable biodegradable waste has almost tripled in a year. Metal, glass, wood, and cardboard will also be recycled. The environmental aim of the festival is that after 4 years 50 % of all the waste produced by the event is recycled. The Ilosaarirock Festival is committed to the environmental aim. "Disposable" is a swear word in the Ilosaarirock Festival. In the licenced bar areas, only recyclable cans and reusable, washable plastic pints or cups will be used. The festival area decorations are made of recyclable materials, and the same decorations are used from one year to another. Only the regular gear necessary for camping is allowed in the camping areas. The Ilosaarirock festival promises to increase recycling and make it easier. The Ilosaarirock Festival area comprises a park area and a beach, and it is important to treat these areas with care. More than 300 cleaners will be at work during the building of the festival as well as the during the festival itself. Separate groups pick up bottles so that they too will be recycled not only on the soles of your feet. If there is any damage on lawns or greens, these will be fixed together with the gardeners of the city of Joensuu. The Ilosaarirock festival promises that the areas are cleaner after the festival than before the festival. According to the environmental aim of the Ilosaarirock festival, the carbon footprint of the festival will decrease considerably during the next 5 years. The carbon footprint will be assessed every year, and compensation will be paid for emissions. The carbon dioxide emissions of the festival are assessed annually, and compensation is paid for them to a chosen protection target. The emissions were assessed for the first time on the Ilosaarirock 2010. The assessment also enabled us to map out those areas in which it was possible to reduce emissions. The assessment for Ilosaarirock 2011 is ongoing. The results and the compensation target will be announced in May. Ilosaarirock festival promises to diminish its carbon footprint. 99 % of the electricity used by Ilosaarirock is green. The local electricity company Pohjois-Karjalan Sähkö Oy offers green electricity produced with hydropower, wood energy, and wind power. Ilosaarirock promises to keep using green electricity. A large part of carbon dioxide emissions comes from traffic. The audience, banda, and subcontractors all travel to and from the festival area, often in their own vehicles. Ilosaarirock minimises emissions by favouring Joensuu-based suppliers and encouraging the audience to use public transport. During Ilosaarirock, regular trains have extra carriages and special Rokki trains also run in line with the festival timetables. From the Joensuu railway station you can go to the festival site in a free bus, and also take the bus back to the railway station. Local festival goers are encouraged to come to the festival by bike or on foot. There is a guarded bike park for cyclists. Parking spaces reserved for those arriving by cars are not free. The Ilosaarirock festival promises to reduce unnecessary traffic. Ilosaarirock supports sustainable development. The festival chooses products produced within ethical guidelines, and uses primarily local suppliers. The main communication channel of the Ilosaarirock is internet instead of printed matter. All coffee in Ilosaarirock is fair trade coffee. There is a Fair Trade café in the festival area where you can enjoy your coffee in a sustainable manner. The Ilosaarirock t-shirts are made of organic cotton, and only renewable energy has been used in their production process. The starting point in the production is minimising the ecological footprint. Ethics and ecology dictate all purchases. The Ilosaarirock festival promises to buy ethically and drink fair trade coffee. Ilosaarirock promotes a green attitude with its customers, workers and partners. Before the festival, advice for a greener festival experience is given in promotional material, the festival website, and the festival programme flyer. During the festival, the environmental point of view is brought out in short info films on the stage screens. The Ilosaarirock festival workers, organisers, and board are all committed to participate in the Ilosaarirock festival environment work and to put into effect the set environmental aims. The Ilosaarirock festival promises to be greener and gooder. We will happily receive your suggestions on effective environmental protection! In 2011, Ilosaarirock received the international A Greener Festival Award, which is a significant acknowledgment of the environmental work that the festival has carried out. Ilosaarirock is the first festival in Finland to be awarded this certificate. To be given this award, the applicants need to fulfil strict criteria. The award is a concrete testimony of the efforts that the festival has made to be greener and more environmentally friendly. Ilosaarirock has also been awarded the international Green'n'Clean environment certificate in 2008, which was the year the award was launched in Finland. 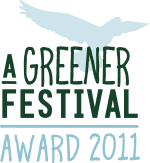 The award is a concrete indication that the festival pays attention to enviromental friendliness and green values. The green values of the Ilosaarirock festival are using green electricity, enhancing recycling, encouraging people to use public transport and ride-sharing, and regarding purchases, preferring sustainably produced, fair trade, and local products and services.